PART 1 Maintenance video, Nick will show you how to examine and replace three of the most important components of your Shopsmith MARK V…the Drive Belt -- the Poly-V or Gilmer Belt -- and the Drive Sleeve. In this PART 1 Maintenance video, Nick will show you how to examine and replace three of the most important components of your Shopsmith MARK V…the Drive Belt -- the Poly-V or Gilmer Belt -- and the Drive Sleeve. Nick begins with a walk through helping you determine which of the three headstock types your machine has: Type A, B or C. Knowing this information will tell you when your machine was made, as well as which Motor it has; whether it has a single or double-bearing Quill; whether it has a Gilmer or Poly-V Belt and which switch it has. Here, you’ll learn how to determine whether or not you have a Drive Belt problem; how to decide when it’s time to replace your Drive Belt and if it is time, how to remove and replace the Belt. As in the segment above, Nick will lead you through determining whether or not you have a belt problem, and if it’s time to replace the Belt, how to remove the Idler Shaft, Drive Shaft and complete Drive Assembly in order to effect the replacement. You’ll know that it’s time to replace this Sleeve if your MARK V begins to make a terrible racket and your auxiliary Drive Hub is turning while your Quill is remaining stationary. Nick shows you how simple this process can be once the two Belts in the above steps are removed. Here, Nick begins by showing you how to determine whether your MARK V is operating at the speed shown on the Speed Dial, then leads you through the process of making any corrections, if required. INCLUDES 116-PAGE BONUS MANUAL: This video includes an information-packed, 116-page Service and Repair Manual that you can read and/or print as a PDF file from your computer. This is NOT merely the standard MARK V Owner’s Manual, but rather, the definitive document on diagnosing MARK V problems – and resolving them. A MUST-HAVE document that you’ll want to ad to your workshop library. 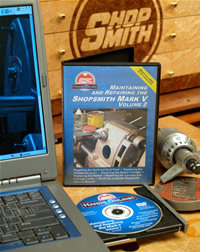 In this PART 2 Maintenance video, Nick will show you how to inspect and repair or Replace five of the most important components of your Shopsmith MARK V.
Nick continues his presentation from Volume 1 of this important series with a look at five more situations that MARK V owners could encounter with their MARK Vs. These instructions begin with a review of how this important mechanism works, then continues to cover removing it, lubricating it, replacing it (if necessary) and adjusting to deliver the requested speed. This segment begins with a review of the two different types of Switches used on MARK Vs, and ends with a quick review of how to replace each type and ensure the proper wiring. Here, you’ll learn how to remove this important component of your MARK V, how to replace single bearing Quills with the more precise two-bearing model (if you so desire) and how to tension he Quill Fed Spring properly. Here, Nick shows you how to remove these locks, dress their wedges for smoother operation and replace the various components, if required. 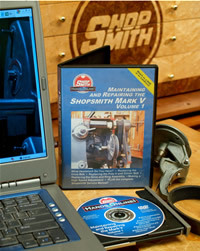 NOTE: For the complete Maintaining & Repairing the Shopsmith MARK V story, we recommend that you order both Parts 1 and 2 of this video…and have established a discounted price for ordering both segments (556069).